I was wrong about Marjorie’s Seedling, it’s just starting to flower today 31st March, Opal, Denbigh Plum and Jubileum now in full flower. Cherry first in flower this year is Summer Sun (open) followed by Kordia, just opening, Stella is surprisingly late this year. Invicta standard gooseberries in full flower but Captivator and Hinnonmaki Green opening leaf clusters and starting to flower. Hinnonmaki Red is well behind, just barely opening buds. After the late start with fruit blossom this year, everything seems to have concertina’d. Here on the North Kent coast, myrobalans were in full flower by 20 March (2 March last year) and remained in bloom for 12-14 days. Plums (Victoria and Coe’s Golden Drop) were in full flower by 30 March; this is later than some years but here the Victoria has flowered as early as 15 March (1990) and as late as 22 April (2006). On 1 April this year pears Williams’ Bon Chrétien and Conference were 90% out and Doyenné du Comice was 50% out. 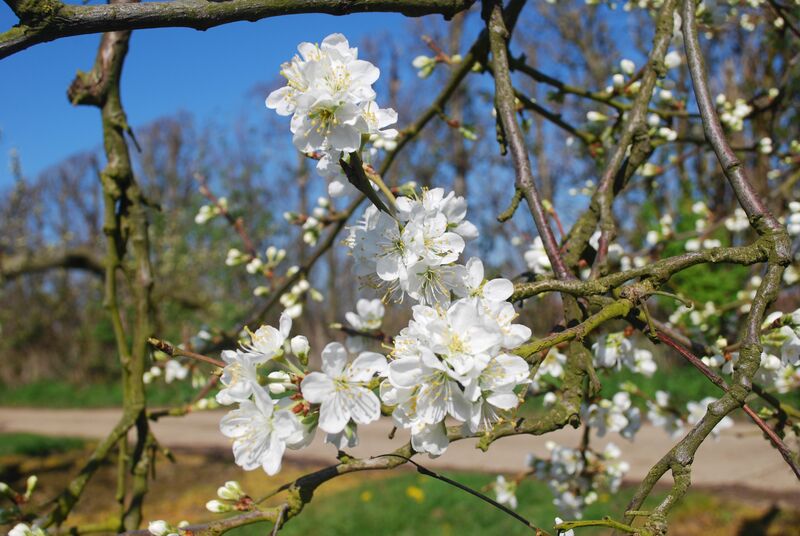 Today (3 April) the Victoria plum is still in full bloom, Coe’s Golden Drop has completely gone over, all three pears are in full bloom and several apples are at the pink bud stage while Malus Donald Wyman is about 5% out.